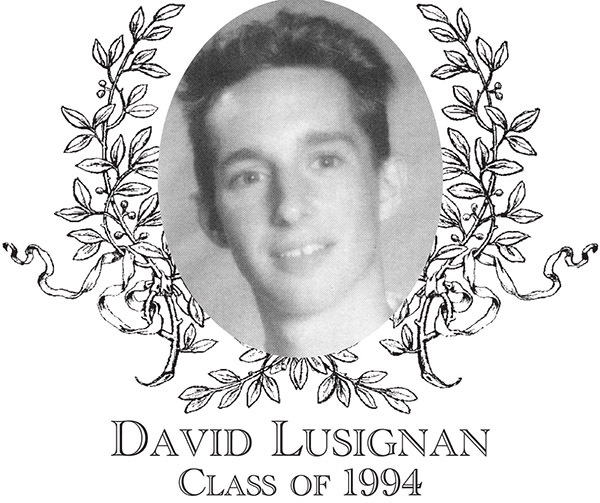 David Lusignan, Class of 1994, was a two-sport athlete, running in cross country and track & field. Dave is one of the finest runners ever to lace up his shoes for Bartlett. Dave was on the cross country team for five years and was Captain his sophomore, junior, and senior years. During this time, his teams went an impressive 50-15. During those three years, Dave placed first for the team 40 times and placed first overall 24 times. Dave helped lead his junior year team to an undefeated 16-0 season. They won the Border Conference League Meet and won the prestigious Wachusett Invitational Tournament, where Dave placed seventh overall individually. Dave was named a Border Conference All-Star his freshman through senior years. Dave became only the second Bartlett runner in 14 years of racing on the Memorial Beach course to break the magical 15 minute barrier for 2.9 miles. It placed Dave 19th overall out of over 1,700 runners who had run the course. Dave's running prowess continued on to the track, running from his eighth grade year to senior year. He specialized in the 3200, 1600, and 800 meter runs. Dave won the 3200 meter race at the Border Conference League Meet three times and finished second once. He helped his sophomore through senior teams go undefeated. Dave's finest season was his junior year, where he was entered into 15 events and placed first in 12 of them. During this season, Dave also placed fourth at the District meet in the 3200 meter setting a school record of 10:40.9, a record which still stands today. Dave was selected as a Border Conference All-Star his freshman through senior years. Dave graduated eighth in his class and was a member of the National Honor Society. Dave continued running after high school, participating in 17 marathons and 4 triathlons. He is also a member of Team Hoyt, running races while pushing athletes with disabilities in a modified wheelchair. Dave is Director of Quality for Maxwell Health. He and his wife Jessica reside in Woodstock, CT and have two children, Maeve and Callum.